Zodiac Milpro (Military and Professional) in Australia has been presented with a plaque to acknowledge its one hundredth purchase of HamiltonJet HJ274 jets. 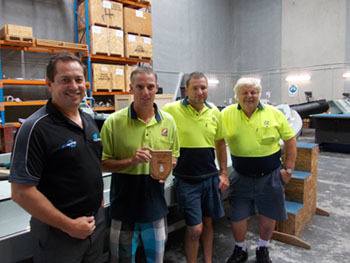 CARINGBAH, Australia - March 18, 2013 - PRLog -- The plaque was handed to Craig Jordan, general manager of Zodiac Milpro Australia, by Robert Larder, managing director of JetSynergy Pty Ltd, which is the HamiltonJet distributor/agent for the Eastern region of Australia. The Zodiac Hurricane® ZH 733 DJ comes from the Zodiac Hurricane range of high performance craft and is a GRP-hulled RIB (Rigid Inflatable Boat) capable of long range at high speeds. Measuring 7.24 metres overall it is popular with military, civil and industrial users seeking a tough and versatile craft that is easy to maintain. When fitted with the HJ274 water jet, the boat has a draft of just .54-metres which makes it ideal for use in some of the more difficult coastal regions of Australia and New Zealand. Zodiac Milpro is headquartered in Paris and supplies inflatable and semi-rigid craft for professional users such as police, coast guard, special forces, anti-terrorism units, fire teams, the offshore industry and other military users. The boats manufactured by Zodiac Milpro and distributed under Zodiac Milpro or Zodiac Hurricane brands, range from 4m to 12m long and are available in configurations that include inflatable and rigid inflatable boats with aluminium or fibreglass hull designs, inflatable or foam tubes, diesel inboard or petrol outboard engines.